KUALA LUMPUR: Two opposing groups of protesters today gathered outside the Parliament building, with one of them demanding that Attorney-General Tommy Thomas resign, accusing him of misleading the Malay rulers on the Rome Statute from which Putrajaya withdrew last week. Another group of protesters were joined by several ruling MPs, urging the government not to delay the establishment of an Independent Police Complaints Commission (IPCMC), following damning findings last week that the police were responsible for the disappearances of two activists in Perlis and Selangor. Also among them were family members of detainees of the Security Offences (Special Measures) Act and those who died in police custody. 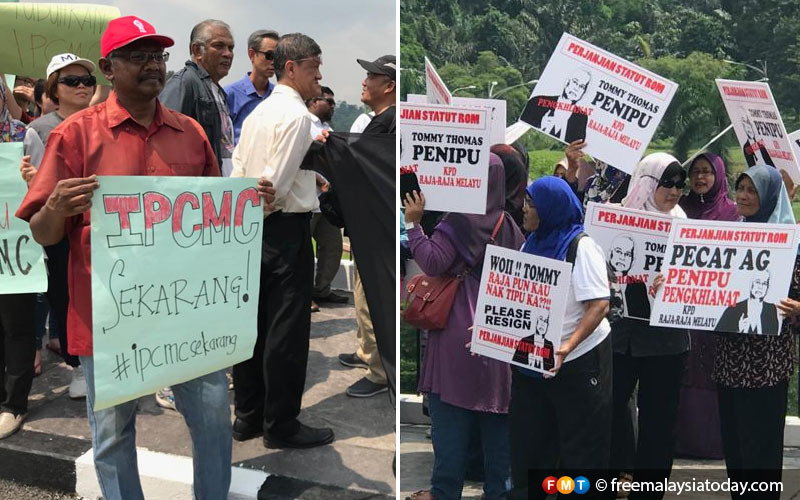 They marched from the nearby Padang Merbok to the Parliament gates holding banners calling for IPCMC, before they were joined by MPs Chang Lih Kang (Tanjung Malim), Kasthuri Patto (Batu Kawan) and Maria Chin Abdullah (Petaling Jaya). Ten representatives from the group were allowed into Parliament compounds to meet with members of the Parliamentary Caucus on Reform and Good Governance, as well as representatives from the home and defence ministries. A rival crowd meanwhile gathered across the road, with placards suggesting that the AG had misled the Malay rulers on the Rome Statute, the international treaty which forms the International Criminal Court (ICC). The protest comes two days after Dr Mahathir Mohamad spoke of pressure from certain parties on Putrajaya to withdraw from the treaty, following claims that it would subject the Malay rulers to international criminal jurisdiction. The group calling for the IPCMC cited a 2017 parliamentary reply saying 257 deaths in police lock-ups had occurred from 2002 to 2016, many of which were reportedly not investigated. They said the IPCMC is necessary to ensure that such cases are investigated by an independent body. In a statement issued to the press, they also said the Pakatan Harapan administration had promised the IPCMC as a means to increase the accountability and efficiency of the police force. The memorandum was supported by over 50 organisations including Suaram, the Citizen Action Group on Enforced Disappearance (CAGED), EDICT, Ikram and PSM. The 10 representatives allowed into the Parliament compounds included EDICT’s M Visvanathan, CAGED’s M Ramanathan, Mahathir Abdul Rahman whose brother has spent four years in prison under Sosma, and PV Elam Sezhian whose family member Karuna Nithi died in custody seven years ago. Across the road, those calling for Thomas’ resignation said Foreign Minister Saifuddin Abdullah, too, should resign. They said the two had pushed for Malaysia to sign ICERD and the Rome Statute despite the agreements violating “Malaysian norms and the constitution”. They also called for any proposal to sign international treaties to be debated in Parliament first although this is not required by the constitution, and for Parliament to be made the executive body. They urged Putrajaya to be more careful in the future and not to be “easily swayed by Western ideologies and beliefs, to the point that Malaysia loses its values as an Eastern country”. Their memorandum was signed by Malaysian Youth Activist’s Muhd Farwan Khairuddin, Kelab Belia Mahasiswa Bangi member Azroy Azri and Mushin Abdul Latheet from Persatuan Kebajikan Surplus. Representatives from this group were allowed to enter Parliament as well.